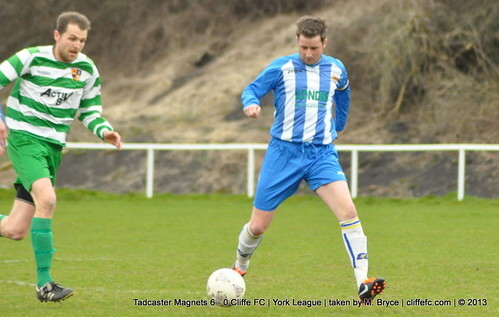 Cliffe FC suffer a 6-0 defeat at the hands of Tadcaster Magnets whilst Cliffe FC Reserves lose 3-1 to Wheldrake to complete a horrible Wednesday evening for the club. On a blustery evening, Cliffe had the wind in their favour for the first half but it was Magnets that lead at the break, bundling the opening goal from close range and a counter attack that saw the promotion-chasing side ahead 2-0 at the break. Returning Chris Harkin came close at 0-0, calling the ‘keeper into action and Ian Beckram had a shot saved before the half-time whistle. 2-0 HT. Magnets came into their own in the second half and scored a further four goals to compound Cliffe’s Wednesday evening woes. However, Cliffe didn’t give up and the scoreline probably didn’t reflect the amount of hard work and what was deserving of their hard work, 6-0 FT. The only positive to come from the game was the surprise return of Captain Chris Harkin who was awarded Cliffe FC man-of-the-match for a positive 60 minutes in his first game for five months since his ankle injury. Cliffe FC have to move on from this fixture and go into next Monday and next Wednesday evening’s matches versus Strensall and Stamford Bridge respectively with a positive attitude as they need to drag themselves away from the dreaded threat of relegation. ~ Dave Hebson, 17th April 2013. Cliffe started slowly not helped by the absence of regular keeper Ally Harris. Wheldrake capitalised by scoring an early goal thanks to their pacey front pairing. A second followed after stand-in ‘keeper Toby Bodycombe rushed out of goal to sweep up a through ball only for the ball to take a wicked bobble over his outstretched leg and Wheldrake again capitalised to make it 0-2. Cliffe looked a different side in the second half and had all the possession and a number of chances that they failed to convert into goals. Wheldrake got a third against the run of play when they finished a half chance with an excellent strike. With 25 mins remaining Cliffe threw everything at Wheldrake who were camped out on their 18 yard box. The hosts pulled a goal back after some excellent running from White caused a melee in the box and the ensuing scramble led to an own goal. The comeback looked on but was soon snuffed out as Cliffe again were denied by poor finishing and an excellent wheldrake keeper, 1-3 FT.
Cliffe FC Reserves need to dust themselves off and look to improve as they travel to face St Clements Reserves this Saturday.